As gamers we have a great shared history of classic adventures. Everyone’s heard of the Temple of Elemental Evil and the Keep on the Borderlands. (In fact, it is thought Keep on the Borderlands may be the most played adventure of all time). 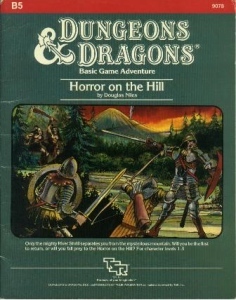 However, TSR released hundreds of adventures for D&D and AD&D. Some are justly famed, but others never garnered the recognition they deserved. Here are four such overlooked gems. If you don’t have a copy, it’s worth tracking down a copy or PDF. This AD&D module is for characters levels 0-1 and starts with the party in chains on a pirate slaver ship. The ship sinks during a ferocious storm and the party are washed ashore on a remote island. From there, they must escape the last of their captors, defeat the various warring factions on the island and escape before a vengeful goddess destroys the island. Included with the module are rules for both 0-level characters and converting those characters into “proper” 1st-level adventurers. 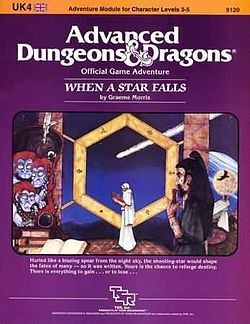 One of my all-time favourite modules, When a Star Falls is for characters levels 3-5. I’ve run this AD&D module several times over the last 30 years, and even included it in my expanded Temple of Elemental Evil campaign. The adventure focuses on the power struggles of the sages living in the Tower of the Heavens. A shooting star – an omen of power – sets events in motion that culminate in a power struggle, with the unwitting PCs proving pivotal to the outcome. As well as lots of opportunities for combat, the adventure features extensive roleplaying encounters and wilderness travel. When a Star Falls also includes one of my favourite new monsters – the memory web. When the PCs slay the creature it bombards them with the memories of others it has slain, which propels them into the adventure. This is one of the best, most memorable adventure hooks I’ve ever come across. I’ve never run this Expert module (for characters level 5-8) , but I plan to in the not too distant future. I love the set-up — a retired adventurer has a magic item that is not what it seems, and the magic items holds a terrible secret. The item — a mirror — is actually an artefact that allows access to a demiplane. The demiplane is now the home of a mad wizard and his small army. Trapped inside, he is intent on escaping and using his forces to wrest control of the PCs’ home kingdom from its rightful king. 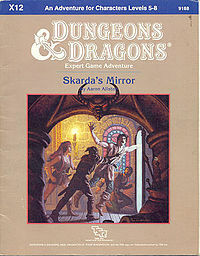 The start of the adventure sees the party drawn into the mirror and into conflict with the mad wizard. Of course, disaster is in the offing – the demiplane is old and the magics maintaining are beginning to breakdown — and the mad wizard escapes back into the world with his servants. The adventure climaxes with the party escaping the demiplane and fighting in the royal palace to protect the king from an ignoble death! Do you think I missed an old classic module from my list? Tell me what it is in the comments below, and add to Ebay’s profits! B10 Night’s Dark Terror – a real classic. Or is it not overlooked? It’s been overlooked by me! I’ve got it, but haven’t read it. Looks like I’ll have to change that if you are saying its worth a go! Definitely worth it and is probably a mini-campaign in its own right. It was made by TSR UK, was designed to bridge the Basic and Expert sets and has lots of lovely hand-drawn maps (some of which amusingly appear in Warhammer Fantasy Roleplay products written by the same authors). I’d love my own copy. It basically formed the template for Gaz1 Duchy of Karameikos. I agree B10 was amazing. Well organized and with several mini-encounters mixed in. I especially liked the full-scale steading map for the siege encounter! Master of the Desert Nomads and it’s sequel were always pretty awesome to me. I always wished they would be revisited or revised. I came here to say “KNIGHT’S DARK TERROR”!!! I’m glad someone else said it too! It’s an absolute classic in my opinion… great set-up as the PCs enter a village where the residents are a bit ‘off’… and then builds with slow reveals to a great climax. I have run this several times and it’s always been a blast. Although it’s default setting is the Gran March in Greyhawk, it really could fit anywhere in any setting. And I agree on Night’s Dark Terror, as my third choice. Good selection. All 3 are gems. N1, that’s another that I’ve ran in multiple systems and it had stood the test of time. I have all but the last one…..and given that they are all gems I shall be tracking that down in hard copy too. I didn’t play many basic D&D adventures – just B1 & B2 – I need to check out B5. My recommendation would be for the excellent UK2 & UK3, The Sentinel and The Gauntlet. UK2 & 3 are tremendous modules. I’ve run them several times and had a blast both times. I even got to play them once as an actual player! I have to agree with this recommendation. Both the Sentinel and the Gauntlet are great modules. I really liked the idea of the good artifacts mission to defeat its nemesis. I actually found that all of the UK modules had that extra level of depth, character and substance than some of their US TSR peers. Other modules I have fun running include Drums on Fire Mountain (which is the South Pacific themed island adventure), the War Rafts of Kron (my first underwater adventure) and the Veiled society. The U Series as a whole is often overlooked, but I was pleased to see several comments mentioning U1 “The Sinister Secret of Saltmarsh”! That adventure is by far my favorite. The setup is excellent and a great challenge. Players must investigate the haunted house. Sounds simple enough, but with the help of a great DM this adventure goes from creepy to awesome within one room/combat. Those who know the adventure probably know the one I am talking about. The whole series is like a mini-campaign unto itself, but sadly U2 was not very good. The finale in U3 is epic – and you’ll never want to adventure underwater ever again (as either DM or player). Often overlooked is the amazing 1983 TSR publication (might be that it can be difficult to find) L2 The Assassin’s Knot. Geared towards 6-10 players, levels 2 to 5 it is the sequel to The Secret of Bone Hill and always one of my favorites as a DM. The interesting thing with L2 is that it contains no Dungeon! Heroes are tasked with solving a murder mystery in the Village of Garrotten, the longer they take, the more tragedy strikes the small Village. This is a gem of a module and a personal favorite. I have used it a few times through the past 25 years and my players always enjoy it. 6-10 players. Thhats awesome. The dynamics in that size party would be great. So 1990s. When was the last time you played with 10 players? Hell, where would you put them? In the Good Old Days, I used a table tennis table to play on and we just about had space for 10 players. Now, sadly, our brave band of 7 completely fill the gaming room. I don’t think we could stuff anyone else in. I dont see much written about them but I truly enjoyed the Ravenloft series. Masterfully written, and in the right hands can be an extremely engrossing campaign! XL-1 Quest for the Heartstone. One of my favorites cause it contained the stats for Warduke. Plus fighting Frost Giants is always fun. The bad thing about this thread is that I’m finding out about so many modules I don’t own. Heartstone is another one to add to the list! I’m hoping he was trolling… As Quest for the Heartstone was a very poor effort written to try to help sell a range of plastic toys. The whole thing was very uninspiring. You’ve already had the recommendations from others of my own favourites. UK3, U1, N1 – the low level AD&D stuff from the early 80s was often inspired! You can make an entire campaign out of this one module. I’ve got this, but never read it. Looks like I’ll have to take a look. Castle Amber and Nights Dark Terrors have come up time and again as great modules to take a look at. Thanks for the recommendation. Castle Amber is my all-time fave module. I’ve read it at least 20 times and run it probably 6 to 8. Castle Amber is one of the best ever, right up there with Keep on the Borderlands and Elemental Evil. It’s also the first module I remember playing. Takes me back to a happy time, so it’s that much more special for me. Ok….a couple of thoughts….B4 is a favourite….The Lost City. It had atmosphere and scope aplenty for a complete campaign if the PCs actually get to the underground city… UK6 (?) All that Glitters….i would also recommend for something with an exotic location and some neat twists. X2 Castle Amber is another favourite from days past. I ran it several times and always felt the back story of the degenerate family in a cursed mansion stood out as a concept at the time….which translated well in play. B4 was one of my favorites, but it is a pale imitation of The Caverns of Thracia. I agree with all of them and would add B3 palace of the silver princess. Cool story line. B4 and B5 are the best in the series. For those gamer’s who haven’t been around since the 80’s (can’t include myself there) what would you consider to be on the “classics” list? Did I miss that list somewhere? Obvious choices are the Slavers series (A1-4), Giants/Drow (GDQ), B2, X1, S1-S4 & T1-4. I would throw in the Desert of Desolation series (I2-4) and a few of the WG series and Dragonlance modules. Great question! I’ll have to ponder that as, as you say, so many choices are so obvious. I think you’d definitely have to put Sinister Secret of Saltmarsh in the classic list. In particular, the first module was absolutely brilliant. I don’t remember the number of the module, but The Lost Caverns of Socanth (sp?) immediately comes to mind. That adventure was, for all intents and purposes, my initiation into D&D. Talk about baptism by fire… That module was freakin’ tough! S4 – The Lost Caverns of Tsojcanth. Pretty good guess on the spelling, and yes it is a beast. Those modules are all ones that I have overlooked. Now that I am firmly in the middle class, I have been slowly acquiring all the modules that escaped me in my youth. Perhaps these will now be on the list. 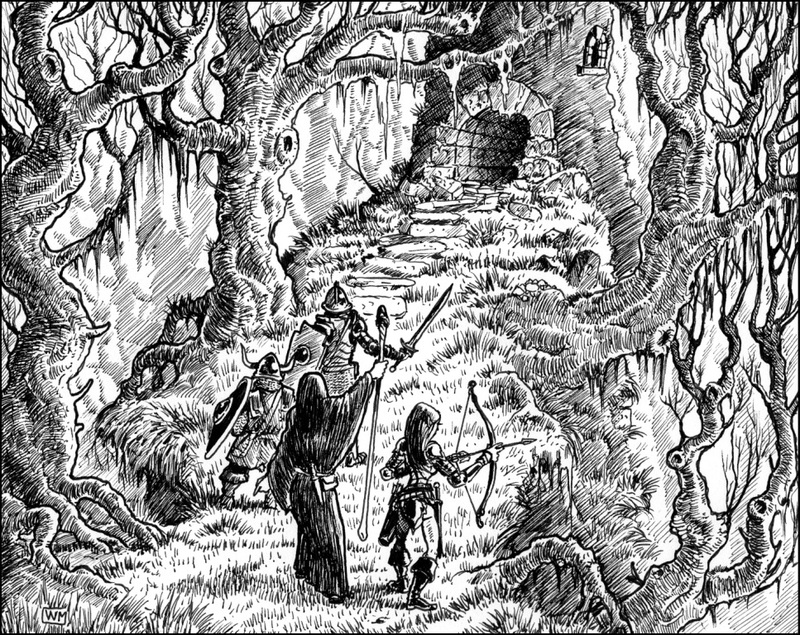 One that you might have overlooked, but I would consider a more recent classic, is the Madness at Gardmore Abbey…converted to 1st/2nd edition AD&D. Our group has been playing it in our last 4 sessions of our bi-yearly game (friends come up from Florida to Minnesota for Christmas and summer vacations. I joined the game in 1998.) If the module was done in an earlier era, it would NOT be on the list as it would be one that everyone would have played. PS For an 80s classic… I1 Dwellers of the Forbidden City. Journey through a jungle to find a mysterious lost city. Exploration in an exotic location -a must for those that enjoyed a Tarzan yarn in their youth. Thank goodness you restricted it to TSR modules, can you imagine how many you would have gotten otherwise? Even so someone mentioned The Caverns of Thracia (which was great), so I guess it is okay to bring up other judges guild stuff like Tegel Manor and Dark Tower. From the Shadows (RQ3) was one of my all time favorites. The look on the players faces when the start figuring stuff out is priceless. There are two adventures that have always been my favorites, and many people have already mentioned B10, Night’s Dark Terror. The other one is C3 The Lost Island of Castanamir, which details one of the most fun locations to explore I’ve ever read. The PCs, intending to approach the island, are instead shipwrecked on it, and must venture into Castanamir the Mad’s home for shelter. The spatial warping in the home is wonderful – I was reminded of it with the PAX East 2015 game of Acquisitions Incorporated, with all the moving rooms. That’s not exactly what’s happening with Castanamir, but it was reminiscent for me. If al-Qadim adventures count…………just about any of them, but especially Wolfgang Baur’s Assassin Mountain. For #3 Mark you get bonus points! Excellent adventure that I never ran, but read many times. Super stuff! UK4 – I’ve ran it in just about every system (1e, 2e, 3.x, C&C, and soon in 5e). Graeme Morris really knew how to write a good hook but not railroad. I agree that another of his adventures B10 Night’s Dark Terror is a perfect example of a module that allows the DM to make it their own. I’ve been working on a homebrewed version of Horror on the Hill on one of my streams. I LOVE this adventure. There’s something for everyone, and a brilliant way of getting a party together and testing them out. EX1 followed by EX2 – use these for when you want to have some light relief. X4 Master of the Desert Nomads and it’s sequel X5 The Temple of Death, both by David Cook, with art by the immortal Timothy Truman in X5 are two of the best Expert level adventures ever published by TSR, in my opinion. Also often overlooked is I2 Tomb of the Lizard King, which is another favorite of mine along with I8 Ravager of Time. Good idea! I never thought of linking the two modules like that! Skarda’s Mirror begs you to give the players access to somwhere weird. Is it another continent they haven’t heard of, another world, or another plane? The last is the traditional choice in D&D history. Heck it could be another time (though this is usually a can of worms in D&D adventure coherency). Given the module’s content, it could easily be a screwjob where you strand the players somewhere, but I think it’s more satisfying when you give players access to stuff and let them find their own trouble. One of my favorites (alongside TOEE) is “The Vale of the Mage”. The ‘enemy’ party the players must deal with are a group of spellcasters with the exception of one who is actually a fighter pretending to be a mage (my favourite to DM. Great stuff as usual – brings back old memories and inspires new endeavours. If I can ask, how have you included When a Star Falls in your expanded Temple of Elemental Evil campaign? My players are nearly finished in the Moathouse Ruins, and I was thinking about giving them a small diversion before they start the actual ToEE, When a Star Falls sounds perfect. During the exploration of the temple’s upper levels the party found the poem/prophecy detailed on page 44 of the megamodules. They wanted to know more about it and I told them they’d heard about a certain Tower of the Heavens wherein dwelled many knowledgable sages. Off they trooped. 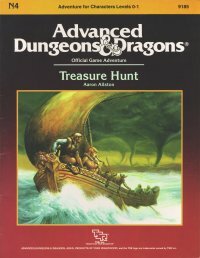 What’s good about Treasure Hunt? The idea is interesting, and the execution is super boring. Lots of telling the DM and players basically exactly what to do, along with a very poorly considered class-and-alignment railroading system. Linear and dull, and uncreative. PASS! Level 0 is a great idea. I love DCC funnels. It’s easy to make a level 0 adventure exciting because it’s so easy for people to die. You just need some challenges and flavor and it’s going to be fine. Treasure Hunt fails on both respects.